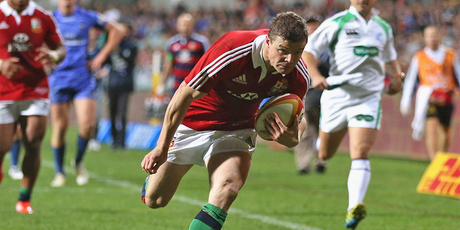 Lions centre Brian O’Driscoll has been dumped from the British and Irish Lions team in a sensational move by coach Warren Gatland ahead of Saturday night’s series decider against the Wallabies. O’Driscoll was expected to captain the Lions in his final game for the tourists but Gatland has kept faith with Jonathan Davies as fellow Welshman Jamie Roberts return from a hamstring injury for the ANZ Stadium blockbuster. It’s one of six changes to the Lions’ starting 15, which includes 10 of Gatland’s players from Wales. O’Driscoll, 34, is paying the price for a disappointing display in the 16-15 second Test loss at Melbourne’s Etihad Stadium, where he called the shots in the final 12 minutes after skipper Sam Warburton was replaced. The Irish centre made his Lions debut in Australia in 2001 and had declared this tour his Holy Grail. Gatland has chosen Alun Wyn Jones as captain while Irishman Sean O’Brien has replaced Warburton (hamstring) at openside flanker. Lions: Leigh Halfpenny, Tommy Bowe, Jonathan Davies, Jamie Roberts, George North, Jonny Sexton, Mike Phillips; Toby Faletau, Sean O’Brien, Dan Lydiate, Geoff Parling, Alun Wyn Jones (capt), Adam Jones, Richard Hibbard, Alex Corbisiero. Res: Tom Youngs, Mako Vunipola, Dan Cole, Richie Gray, Justin Tipuric, Conor Murray, Owen Farrell, Manu Tuilagi.